A second chance to get love right was granted Anne Elliot and Captain Wentworth eight years after their first failed attempt in Persuasion by Jane Austen. Anne had allowed herself to be guided by duty and the sense of those whose opinions she felt honor bound to respect. Captain Wentworth had sailed off with uncertain prospects. For them all had worked out well in the end, for theirs was a true love that withstood the test of time. But while they managed to find their second chance within the span of one lifetime, what if others required more time to get it right? What if they had required multiple lifetimes? In Almost Persuaded by Mary Balogh Jane Everett and Captain Robert Mitford have had many lifetimes of failed love, each of those lifetimes forgotten with the beginning of the next. However, this time they have a chance to get it right and get their happily ever after if they can each get past the things that hold them back. Like our beloved Anne Elliot Jane Everett is the middle daughter of a vain baron. But Captain Mitford is the elder brother of the current vicar near the Everett estate, whom Captain Mitford is visiting. Here is were the similarities, though present, begin to diverge, and Jane and Robert’s tale takes on a life of its own. With flashes of memories and a sense of previous intimacy the two are drawn together. As you might expect, but what makes this short story something quite fascinating is that while the focus is centered on Jane and Robert there are other relationships connected to their story, other characters whose lives are connected to the past and present. For a short story, a mere 78 pages in my paperback, it felt like something much fuller. There were moments of unrestrained feeling, which included some physical intimacies not found in Austen’s writing, but I found it fitting for the story that Balogh unfolds between these two eternal lovers. Within the confines of these few pages there were moments of uncertainty for me as a reader, moments where I wasn’t sure which way things would go. And that is probably the best indicator of a well written story, no matter the length. I like an element of unpredictability. 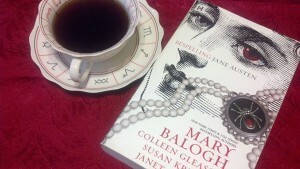 Almost Persuaded by Mary Balogh is one of four short stories contained within the anthology Bespelling Jane Austen. It also features: Northanger Castle by Colleen Gleason, Blood and Prejudice by Susan Krinard, and Little To Hex Her by Janet Mullany.